The beauty of spring is that we no longer have to buy expensive fresh herbs from the grocery store, which often go bad before we get to use them all up. We are now able to pick our own fresh herbs either from a window box or a home garden. There’s nothing like using fresh herbs and here’s a pesto recipe that will beautifully leverage the bright flavours of the fresh herbs in your garden. This is an updated version of the pasta served with pesto. The pesto is comprised of four herbs which you should hopefully have in your herb box or garden; parsley, tarragon, sage and basil. The difference between the basil pesto and this four herb pesto is that these herbs are chopped and not taken through the blender so the flavours of each herb is much more prominent. 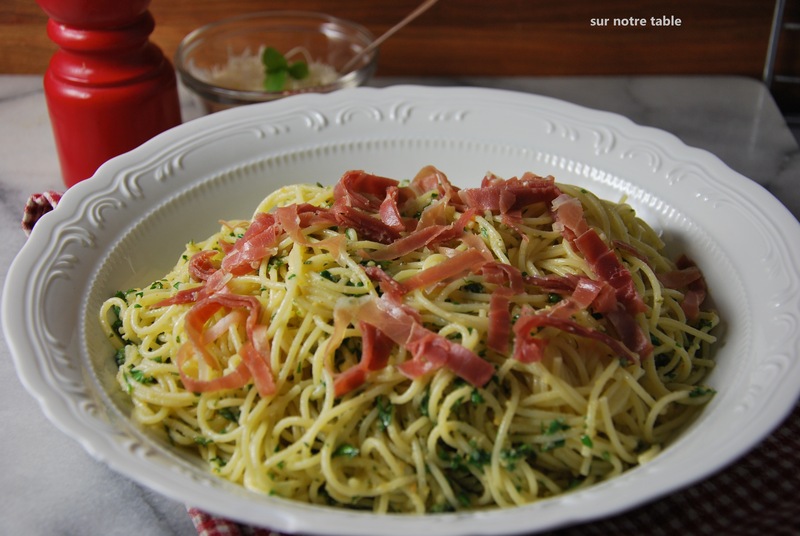 The four-herb pesto spaghettini can be served as is for a vegetarian option, but if you enjoy a little protein as I do, you can simply top the pasta with chopped strips of prosciutto as I have done here. The pesto can be prepared a few hours in advance and then combined with cooked pasta when ready to serve. Boil lightly salted water in a large pot over medium-high heat for the spaghettini. Finely chop the parsley, basil, tarragon, and sage and place in a bowl. Sprinkle the lemon juice on the herbs and coat the herbs with the lemon juice. Combine the garlic, Parmesan cheese, and pine nuts in the blender or food processor. Then add the olive oil slowly as the machine is still running and process until mixture is creamy and fully blended. Pour this oil mixture into the bowl with the herbs and stir to combine. Add the spaghettini to the boiling water and cook according to package instructions. 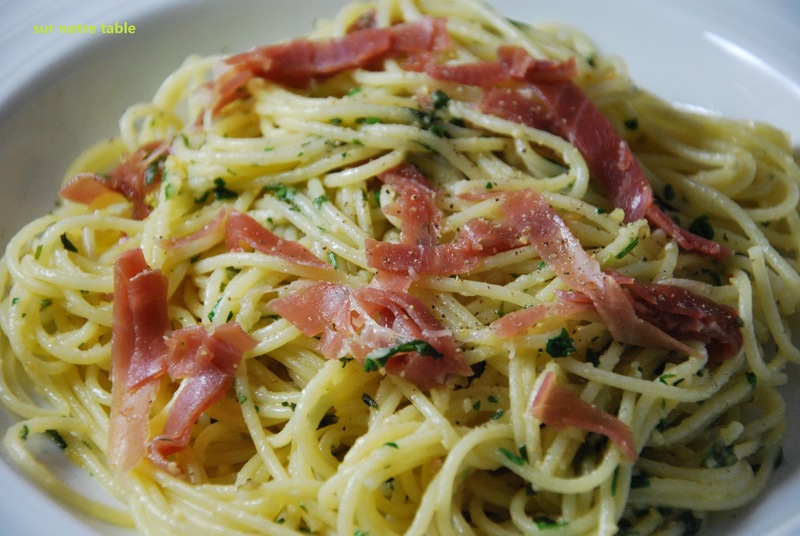 If you wish to top the pasta with prosciutto, while the pasta is cooking chop the prosciutto into ribbons and set aside. When the pasta is cooked, drain and transfer to a serving bowl and toss pasta with the pesto, a pinch or two of salt and a few grinds of pepper. Top with the prosciutto and serve. 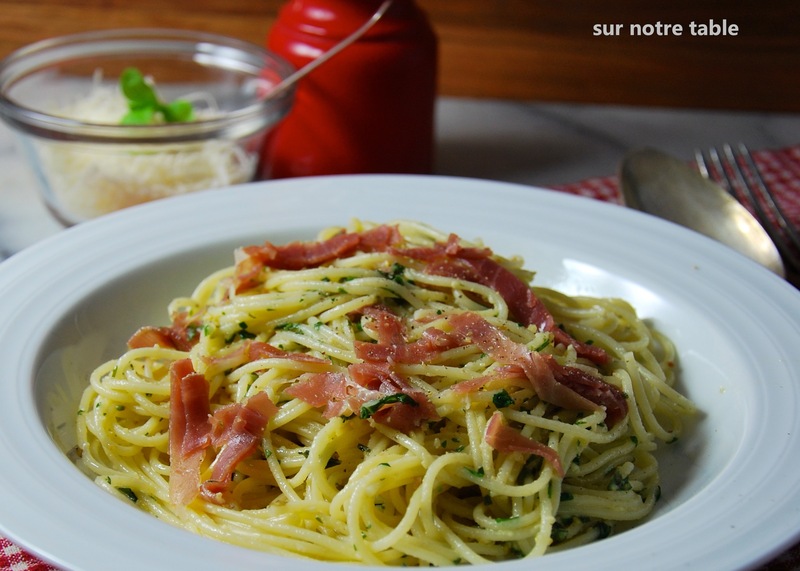 This entry was posted in Easy, Main course, Make ahead, Meat, Pasta, Vegetarian and tagged dinner, easy, fresh herbs, make ahead, make in advance, parmesan, pasta, pesto, proscuitto, spaghettini, vegetarian by Caroline Reny. Bookmark the permalink.